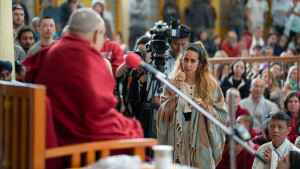 (TibetanReview.net, Apr17, 2018) – The Dalai Lama has on Apr 16 taken time out to meet with tourists visiting his exile hometown of Dharamshala. He interacted with more than 1500 foreign tourists at the Tsuglagkhang courtyard, the town’s main Buddhist temple located across his residence. The tourists were reported to be from 68 countries in Asia, Australasia, Europe, North and South America, and Africa. 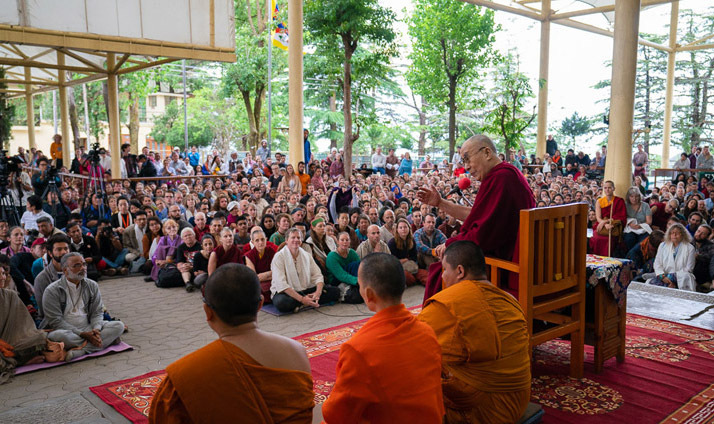 The Dalai Lama spoke about the oneness of humanity and the basic nature of humans being compassionate. He called for more understanding among each other by people across the world and said the 21st century world should not repeat the mistakes of its 20th. He also spoke about inner peace, calling it the basis of self-confidence. Children should be taught about inner values and moral principles through a secular approach in schools instead of self- centered attitude, he was reported to have said. The Dalai Lama was also reported to have emphasised the importance of the Tibetan language, the only one which he has said had preserved India’s ancient Buddhist knowledge. “The rich ancient knowledge of Nalanda is lost to the world now. However, due to the painstaking effort of the Tibetan translators, this knowledge is now available only in Tibetan language. Therefore, the preservation and study of Tibetan language is crucial,” he was quoted as saying. Asked about the likelihood of his return to the Potala Palace, the Dalai Lama said the more important thing was to work for the preservation of Tibetan language and culture, which he said had kept alive ancient Indian knowledge such as the traditions of the Nalanda University. He said the more than 300 volumes of the Kangyur and Tengyur, which are translations of Indian Buddhist literature into Tibetan, contained philosophy, psychology and logic that continued to have relevance and value today. I would like to watch his hollyness talk, is it avaiable?